One of the most popular features of the Milford Upper Charles Trail has been the granite benches. These benches serve several purposes: provide resting spots for trail users; memorialize loved ones who have passed on; and provide a reminder of Milford's past when the town was a source of architectural granite. 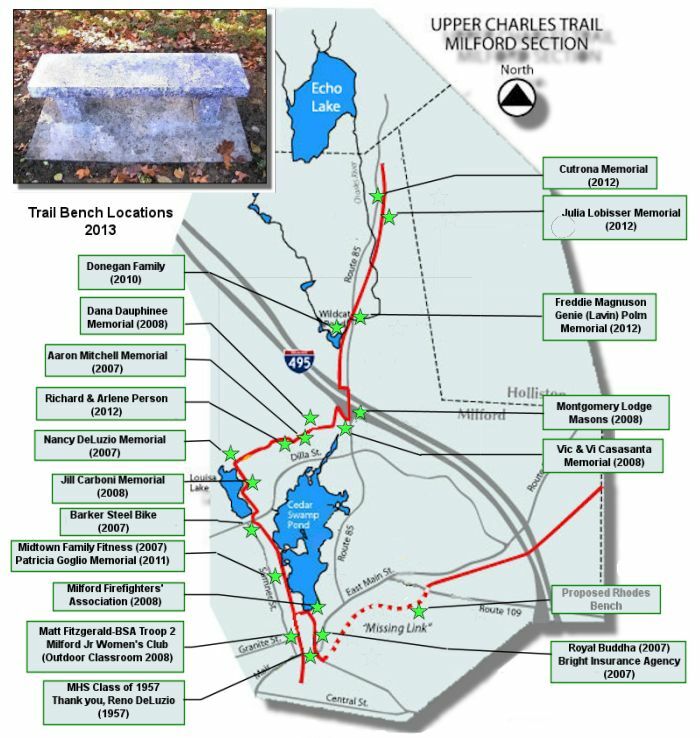 Interested in placing a bench along the Trail? Please note: There is a moratorium for new benches along the existing trail. Please contact us to be included on the bench waiting list. Contact our organization via email and we will be in touch with you for the rest of the process. The Friends have standardized on a classic large rectangular, Deer Isle granite bench with rock sides and rock faced rectangular legs. This is the official bench design of the Trail. We work with a local granite company and installer and have developed a design that is vandal proof and long lasting. The words you want inscribed on the bench are up to you with the Friends approval. Once a location is determined and is approved by the Friends organization we will help you with the process of obtaining quotes and dates for installation. The Friends do not profit on bench installations. The cost for your bench is the responsibility of the donor. You can work with any granite company as long as it meets the standard we have outlined. The whole process from beginning to end should take about 2 months.